What most people do not realize is that Tri County Wildlife Care is not allowed to care for any fawns that do not have spots. Fawns are usually born Memorial Day weekend at the end of May and lose their spots by August. We want to rescue every animal, but this California Fish & Wildlife rule is a wise one for two reasons. Once spots fade from a fawns coat, they are too strong and wild to be handled and treated and if we do try, they will bash themselves against enclosure walls. the fawn was out and totally non-responsive, I asked that she bring the fawn that she had already placed into her horse trailer to the Feed Barn for evaluation. When we went out to the trailer to look at the fawn, it was up and jumping from wall to wall slinging blood everywhere. At this point any action would be dangerous for us and the fawn who had been attacked by several of the callers dogs. Initially all we could do was watch this poor fawn as it slammed from side to side. Luckily it leapt into the attached and open tack room of the trailer. 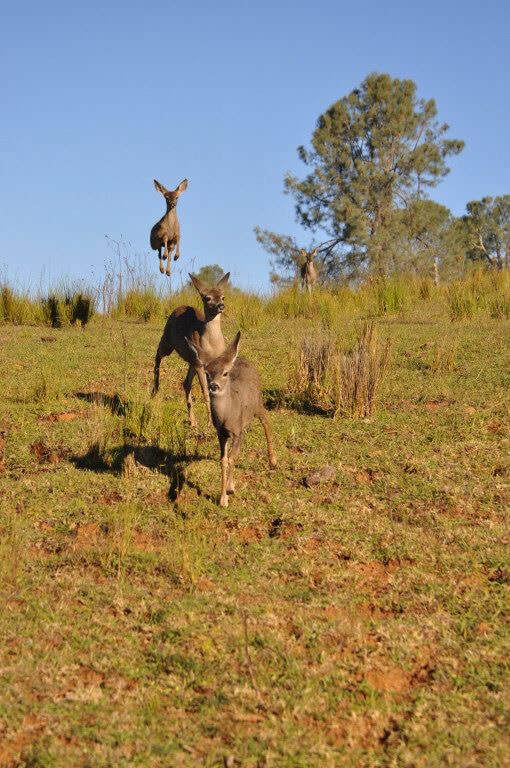 The cowgirl sprung into action leaping after the fawn into the tack room and onto the back of the fawn to hold it down. Now we were committed and I told this cowgirl that she could not let up her grip on this fawn because it had small, razor sharp hooves. We put the crate up to the tack room exterior door, blocked the portion above the door and had this brave lady push the fawn into the crate as she carefully scooted forward pushing the fawn down and into it. Laurie was rehabilitating fawns at this time and she came to take the fawn to Dr. Clay Cockrill. He sedated the fawn in the carrier and expertly stitched up the badly wounded hindquarters, installed a drain and gave him antibiotics. The fawn was then taken to the fawn isolation pen for daily antibiotic treatment and recovery. What happened next showed us that this fawn was past the time to safely treat him. When Laurie and husband Tom went out to the enclosure the following week to give another daily antibiotic shot, he leapt up and out over their heads to freedom. Dr. Clay Cockrill worked with fawns for Tri County Wildlife Care for several years. This is hard work that happens at all hours throughout the Summer months and Dr. Clay gave tirelessly of his time and expertise. He and his caring staff have given so much to the animals of not only Tri County Wildlife Care, but also A-PAL Humane Society too. Dr. Cockrill loved birds of prey and I remember him tube feeding a starving Hawk and evaluating an owl with a broken wing. The clinic staff also took in songbirds, squirrels and any other wild thing needing care. Dr. Clay Cockrill gave his most precious possession to the animals, his time. I like to think that when I see a Hawk soaring in the sky that it might be one he helped get a second chance and that some of the many darling fawns in the Summer may be offspring of some he helped to rescue. 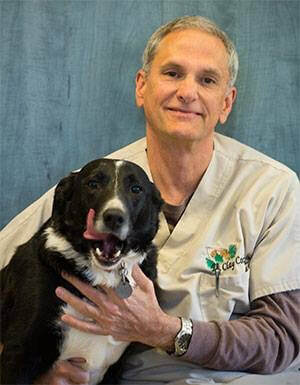 Dr. Clay will be greatly missed by the animals of Amador County and the people who love them.